A sweet summertime treat… in pie form! Preheat oven to 375°. In medium bowl, stir together graham cracker crumbs. melted butter and sugar; reserve 1-1/4 cups crumb mixture. With back or large spoon, firmly press remaining crumb mixture on bottom and up side of 9- to 10-inch pie plate. Bake crust 7 minutes; cool completely on wire rack. Meanwhile, refrigerate 1 container of ice cream 15 minutes to soften. Coarsely chop 2 ounces (about 1/3 cup) chocolate. With rubber or offset spatula, carefully spread softened ice cream evenly in bottom of pie crust. Sprinkle chopped chocolate evenly over ice cream; firmly press reserved crumb mixture over chocolate. Freeze pie 15 minutes. Meanwhile, refrigerate remaining container of ice cream 15 minutes to soften. Remove pie from freezer. Spread softened ice cream evenly over first layer. Freeze pie at least 4 hours or until firm. Place marshmallow creme in center of pie. Moisten spatula with hot water, and spread marshmallow creme evenly over ice cream filling to edge of pie crust, covering top of pie completely. Lightly press mini marshmallows evenly over marshmallow creme layer. Loosely cover with plastic wrap and freeze 4 hours or until firm. To serve, preheat broiler with oven rack 4 to 5 inches from source of heat. Broil pie 20 to 30 seconds or until marshmallows are golden brown, rotating pie occasionally for even browning and watching carefully for burning. 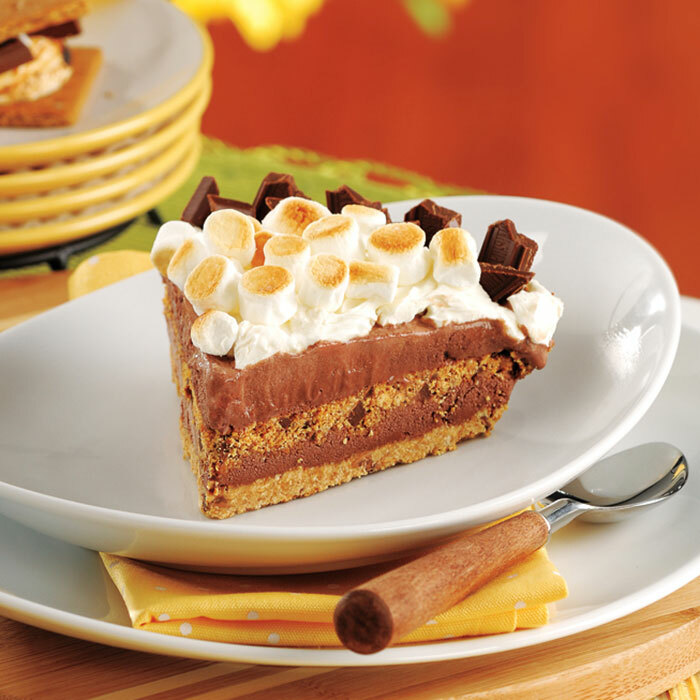 Break remaining chocolate into pieces and insert chocolate pieces into marshmallow creme around edge of pie. To serve, cut pie with a hot knife.